Kittens should now be walking easily and attempting little bursts of running, as well as engaging in adult cat responses such as arching their backs when they are startled. Coordination continues to improve during this stage, and physical activity increases. 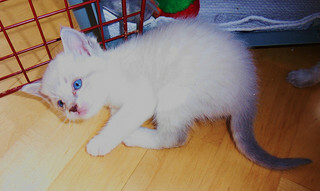 In addition, the feline righting reflex develops, giving kittens a better chance of landing on their feet after a fall. By the end of this period, kittens should have all of their baby teeth (the shift to adult teeth begins around 3½ months of age). Eyes usually begin to change from blue to their permanent colour during this stage or shortly thereafter (though some cats have naturally blue eyes as adults). This process generally completes by the 12th week. If kittens have not developed the ability to eliminate without their mother’s assistance during the 3-4-week stage, they should achieve it during this stage. Continue providing the nursing mom with a high-quality kitten food (the extra calories and protein in kitten food helps replenish her resources). Healthy kittens should be very active at 5-6 weeks. Monitor for signs of illness such as listlessness, lack of appetite, diarrhea, and other problems. Consult a veterinarian if there are any signs of ill health. Accustom kittens to grooming, being placed on their backs, and being inspected (looking in ears, inside mouth, under tail, etc.) so that they will be more comfortable with grooming and veterinary examinations when they’re older. 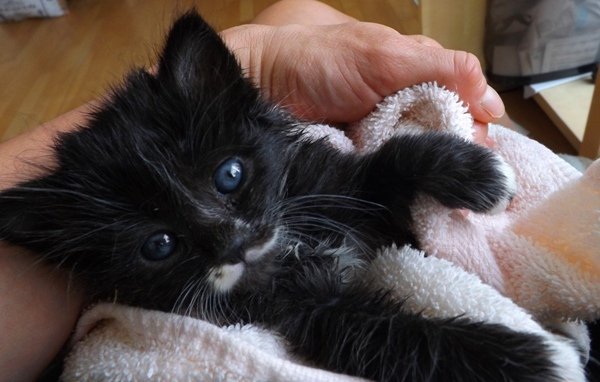 If the kittens suffer from fleas, remove adult fleas and eggs regularly with a flea comb (drop the fleas and eggs in a bucket of hot soapy water to kill them). Continue the socialization process, supervising introductions with a wide variety of people (men, women, and children) and healthy, non-aggressive pets. Positive experiences with various people, animals, and situations during this sensitive socialization period increase the likelihood of raising an easy-going, friendly cat that is free from phobias (negative experiences will, of course, have the opposite effect). Don’t adopt kittens out at this time – they should be with their mothers and littermates for an absolute minimum of 8 weeks, and preferably 12 for proper socialization. Kittens play frequently with their siblings at 5-6 weeks of age, and they may begin to use sneakier strategies, such as hiding before pouncing to ambush a littermate. Social play primarily involves chasing and tackling. While engaging in social play, kittens will experiment to determine what is socially acceptable. For this reason, caretakers should never allow young kittens to bite them. During the sensitive period for socialization, actions that are cute in kittens can become lifelong behavioural problems, so it’s important to set limits during this developmental stage. At the beginning of the 5th week, the weaning process can begin. Transitioning kittens to solid food should be a gradual process that takes place over the course of several weeks. Kittens may continue to nurse sporadically for some time even while eating solid food. The mush should be warm when served, but not hot, and should be the consistency of baby food. Gradually increase the amount of solid food in the mush over several weeks until the kittens are eating solid food only. To begin with, kittens will probably make a real mess of their food, walking all over it and playing in it. Putting food bowls on a large tray can make clean-up easier, as the whole mess can just be rinsed off the tray afterward (putting newspapers down is another alternative). Kittens should eat a number of small meals each day during the weaning process. By 8 weeks, they should be consuming primarily solid food, though they may still nurse a little. Choosing healthy foods is extremely important at this stage, as what kittens are fed tends to shape their lifelong food preferences. Provide only high-quality, high-protein food and bowls of fresh water. Mother cats normally begin bringing prey home to the nest at this stage if they have the opportunity to go out and hunt, and kittens begin to engage in hunting behaviours. Some kittens can kill mice when they are as young as 5 weeks old. At the beginning of the 5th week, caretakers can begin litter training kittens. Kittens often learn how to use a litter box on their own just by watching their moms, but there are things that you can do to speed the training process and reduce the number of accidents outside the box (see How to Litter Train a Kitten for more information). For more articles on kitten development and care week by week, see the Pregnant Cats and Kittens Page. For a full list of cat articles, see the main Cats page. Animal Services – Virtual Shelter. (n.d.). Cat and Kitten Supplement. JointAnimalServices.org. Burns, T., LVT. (n.d.). Hand-Raising Orphaned Kittens. TheCatPracticepc.com. Hartwell, S. (2002). “Hand Rearing Kittens.” MessyBeast.com. IBOK Rescue. (n.d.). “Stages of Kitten Development.” IBOKRescue.RescueGroups.org. Neville, P., & Bessant, C. (1997). The Perfect Kitten: How to Raise a Problem-Free Cat. Octopus Publishing Group, Ltd.
Turner, D., C., & Bateson, P.P.G. (Eds.). (2000). The Domestic Cat: The Biology of Its Behaviour. New York, NY: Cambridge University Press. Veterinary & Aquatic Services Department, Drs. Foster & Smith. (n.d.). “Care & Feeding of Queens & Kittens.” PetEducation.com.